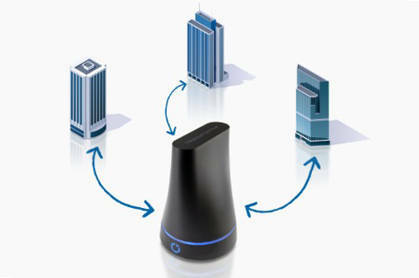 Users of Connected Data's new file sharing and synchronisation Transporter Sync device have been complaining about the mini-Transporter's limitation: there is no local storage. The main Transporter devices have local libraries, but their absence on the Sync means users must store two copies of every file and folder that they sync and share between Sync devices. The Transporter product is a networked storage system which provides a peer network-based private file sharing and synchronisation cloud between a user's networked computer systems - desktops, notebooks, tablets and smartphones. Each of these systems has a network link to its local Transporter device and the Transporters, in turn, link to each other and function like a Dropbox cloud, only without an external cloud service, thus providing greater file security and saving the expense of an external cloud service. The product contains a 2.5-inch hard disk drive, which stores the shared files and folders. This is known as the Transporter library and it is a virtual disk mounted by a host Windows or Mac system and seen as a sub-folder in the host system's main Transporter folder. Connected Data states that "the purpose of Transporter Library is to store the folders that you don't want to keep on your computer as local copies, meaning that these folders are accessed only over the network and are stored only on your Transporter(s). Because every transaction must go over the network in real time, browsing, opening, and saving files to Transporter Library will always take longer than content from Transporter folder." Significant disk space savings on your computer. Access to large media libraries that won't fit on popular flash-enabled laptops. For file copies in which you don't want to wait on a background sync, you can monitor progress with a real-time, system-level progress bar in Finder or Explorer. Any item that you drag into Transporter Library will be copied rather than moved. The original item will remain on your computer after the copy, as with any other copy between disks. You can also keep local copies of your Transporter files in the Transporter folder on your host system. Any files and folders in this will be synced with other connected Transporter devices and, as they are on directly-attached storage, will be accessed faster than copies on the networked Transporter. Connected Data then developed a less expensive Transporter Sync product which had no disk storage of its own and, apparently, did everything a Transporter did - except it couldn't provide Transporter Library functionality as it had no local storage of its own. This restriction was not mentioned in the Transporter Sync data sheet (PDF) but was referenced in a Connected Data Knowledge Base article. However, you can connect an external disk drive to the Sync product using a USB connection. Despite this ability to give it local storage there is still no Transporter Library functionality. Users have said they want the Transporter Library function provided with the Transporter Sync device. Here is an extract of one user's communication to Connected Data: "I bought the Transporter Sync for the full feature set of the File Transporter, just as the literature led me to believe."